USANA, word! : Are you defined by Age or Activity? When you look at your daily life, do you see yourself couched up in front of the tele or brooding over aches and pains, or do you see yourself being up and about enjoying life to the fullest? When you imagine your future, what do you dream of doing? Running down a sandy beach? Cycling down that challenging path? Hiking through the outback? Globe-trotting? Golfing at world-class resorts? Swimming in that pristine pool? Playing with your kids or grand-kids? The options are limitless. Whatever you dream of, chances are hobbling around in pain is not part of the scene. The unfortunate fact is millions of people’s futures look a little bleaker because they are hindered from being themselves and doing the things they love due to joint pain. Fortunately, there are steps you can take to keep your joints healthy, to put back activity in your lifestyle. In addition to being smart about exercise, wearing the right shoes, and maintaining a healthy weight, taking USANA’s newly upgraded Procosamine every day gives you a little extra insurance that your future won’t see you sitting on the sidelines. Keep your joints strong and flexible by delivering the building blocks needed to maintain healthy cartilage, connective tissues, and synovial fluid — the main components of your joints. Glucosamine occurs naturally in our bodies to help preserve joint function, but as we age our bodies produce less. Adding it to your diet is a good way to bolster your body’s natural recovery from daily wear and tear. And now that USANA has switched to an equally effective, vegetarian form of glucosamine blended with key joint-supporting minerals, you can get the same results as glucosamine sulfate without the worry about shellfish allergies or farming. Keep your joints feeling good with an innovative ingredient, Meriva curcumin, that has been clinically shown to positively impact joint comfort. Meriva wraps curcuminoids (curcumin comes from turmeric) in a fatty layer to protect them from stomach acid and help them get through cell walls more easily. Because the ingredient is absorbed 29-times better than standard forms of curcumin, we’ve been able to deliver the same results as our previous Procosamine formulation in only three tablets a day instead of four! Defend your body’s cells against damaging free radicals through the antioxidant activity of both Meriva curcumin and vitamin C, which your body also needs to make collagen — another important component of joint health. So don’t let age or inactivity tell a tale on you. 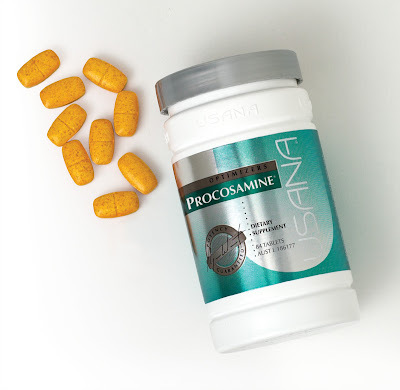 Give your joints a boost with USANA’s New & Improved Procosamine!